The scapholunate space is widened. There is slight proximal migration of the capitate. Radiocarpal joint is narrowed. Osteophytosis and subchondral sclerosis are seen along the triscaphe joint. Small ossicle projects over lunotriquetral joint. 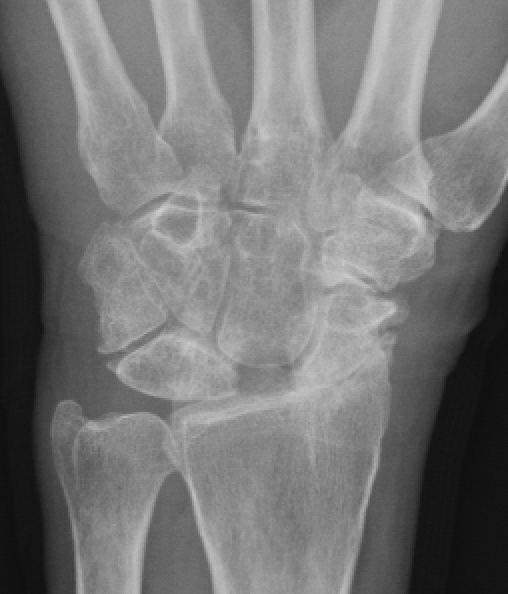 Scapholunate advanced collapse (SLAC) wrist can result from several conditions, which include scapholunate dissociation, osteoarthritis, scaphoid nonunion, avascular necrosis of lunate (Kienbock) or scaphoid (Preiser), inflammatory and crystal deposition arthropathies.